These yogurt recipes may cause you to see a side of yogurt that you never knew existed before! Most of us are accustomed to eating the mixed yogurt, fruit and sugar from the store-bought containers, but, did you know yogurt can also be used to make delicious drinks and dips? Or, that plain yogurt can be used in a very similar manner to sour cream: on baked potatoes, or mixed in creamed potatoes, as a thickener in soups or a garnish atop them, or in waffle and pancake batter for lighter, fluffier cakes? It can also be used to make a soft cheese, known as labneh, and is the basis for a cool, refreshing Indian drink called lassi. Yogurt dips are also becoming an increasingly popular alternative to traditional dips for chips, crackers and vegetables. Because of its versatility, inexpensive cost and fresh flavor, homemade goat milk yogurt is a great item to add to your food staples list. With delicious goat yogurt in your refrigerator, you'll be prepared for any dish, from appetizers to entrees to desserts to beverages! Yogurt is easily made at home without any special equipment. You can read the directions here on How to Make Yogurt. Because yogurt is a fermented product, much of the lactose in the milk is removed during the fermentation process, making yogurt much more digestible for those with lactose intolerance. You can read more about this condition in Lactose Intolerance and Goat Milk. Additionally, the bacteria used as the culture for yogurt are beneficial for gastrointestinal health. With all these benefits, I know you must be anxious to find out all the delicious ways to begin adding yogurt to your diet, so let's get started! 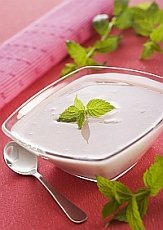 Below are links to a variety of recipes using yogurt. Like all recipes, they are only a starting point. Make them your own by customizing amounts and ingredients for your special tastes or needs. Want more tips for making and using your own homemade yogurt? Visit Yogurt-Everyday.com to get started. Do you have a great Goat Milk Yogurt Recipe to share? We love to hear great new ideas from our visitors! Share your favorite recipe, and have it featured on its own web page! A picture of your dish is optional, but it will really add value to your submission. Click on the blue question marks for help. Please share only recipes that you have actually made and enjoyed...and THANK YOU for taking the time to make our visitors' experience here even better! First--Provide your best, mouth-watering description of your recipe. Second--Include a list of ingredients and supplies needed. Third--Include detailed directions for making the recipe. When finished, carefully read over your directions (or have a friend or family member read them) and ask yourself if the directions are specific and clear enough to be understood by someone who has little cooking experience. If you need to, add more detail or explanations. Don't worry--your writing doesn't have to be perfect! Just write as if you were sharing your recipe with a friend! Do you have a picture of your fabulous recipe to add? Great! Click the button and find it on your computer. Then select it. Recipes are updated frequently, so check back here for any new information related to recipes for yogurt!